Bollywood actress Sonam Kapoor has been announced as the new face of Chopard perfumes. And to attend the glam Chopard event, the 33-year-old wore a bespoke Danielle Frankel shirt gown, and it is ‘comfortable yet so chic’ in every way. And it’s one hot expensive dress! 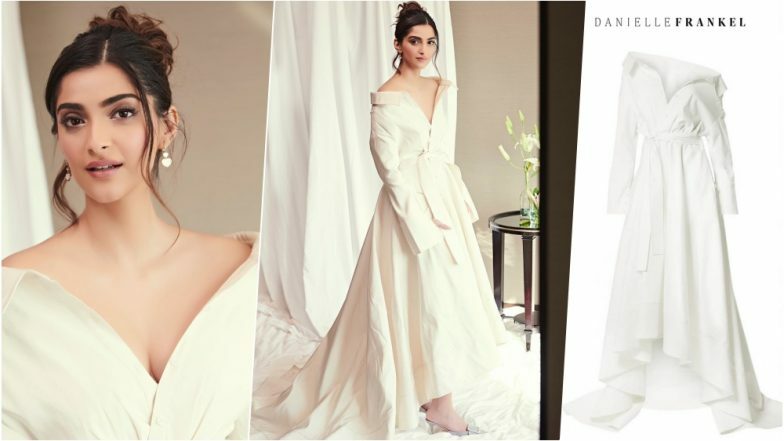 While shirtdresses are ‘bae’ especially when braving heatwaves but thanks to Sonam, one can think of adding long shirt-gowns in their wardrobe this summer season – provided you have £5,360 (almost five freaking lakhs!) to shell out on a dress. Yes, they’re very pretty and pretty expensive! Sonam Kapoor in Calvin Klein Pantsuit and Mark Bumgarner Dress Is Every Fashion Lover’s Dream (See Pics). Film producer, stylist and Sonam’s sister Rhea Kapoor shared gorgeous pics of the Ek Ladki Ko Dekha Toh Aisa Laga actress. Rhea writes, “@sonamkapoor the new face of @chopard Parfums. In @daniellefrankelstudio and @chopard jewelry.” And this post demands your attention. Because Sonam is giving serious summer style goals. Sonam Kapoor Flaunts Her Curls in This New Photoshoot and Honestly, It Makes us Eager for The Zoya Factor. She is wearing an off-shoulder, button-down long shirt dress that boasts of a high hem. A perfect outfit for a summer evening, this tailored look is from Danielle Frankel’s Fall 2018 collection. There is so much to love about this DANIELLE FRANKEL Lou off-the-shoulder cotton-blend poplin gown. It is made up of 97 percent cotton and 3 percent polyurethane, which is just perfect for summers. 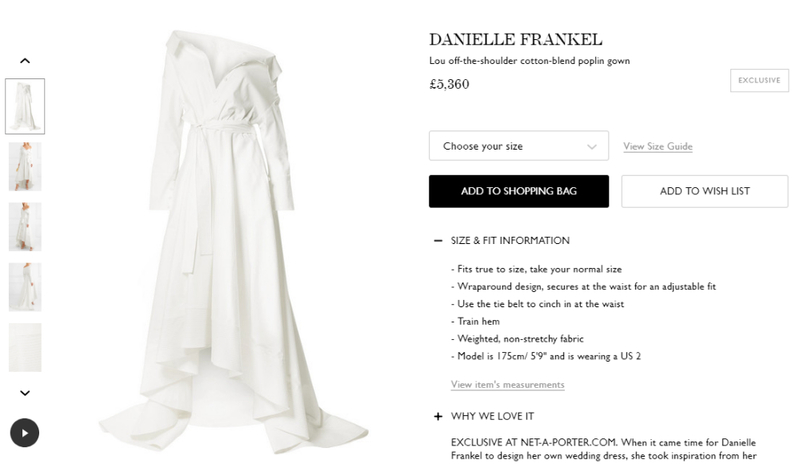 The official website of Danielle Frankel describes this outfit, which is basically a modern bridal outfit as: “Cut to sit effortlessly off-the-shoulder, this cotton-blend poplin style has a waist-defining belt and discreet pockets to store a cell phone so you can take selfies throughout the night. The dramatic hem has a quilted trim to hold its shape and is strategically cut shorter at the front, preventing any missteps.” Perfect for all the clumsy walkers out there. Speaking of the wraparound dress cost, it will cost the person a bomb. It is priced at £5,360, which is roughly 4 lakhs 86 thousand (value of 1 pound sterling = INR 90.90 at present)! Yes, almost five lakhs in Indian currency. Sonam Kapoor’s OOTD can fund several travel trips, buy the latest gadgets, bikes and everything you have been dreaming up for a while. And with Chopard jewellery and those pretty kitten heels, the overall worth of Kapoor girl’s OOTN is only skyrocketing. However, this is one of our most favourite looks of Sonam this season.